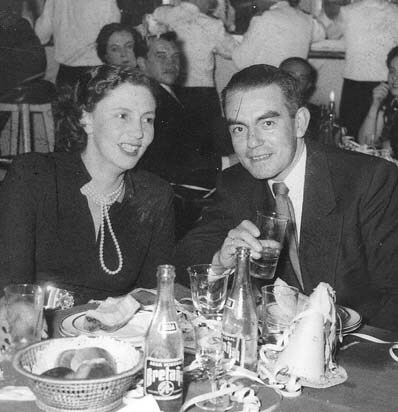 1952 Mom and Dad enjoying a night out in one of Bogotá's trendy restaurants. Perhaps, it could be a New Year's celebration. 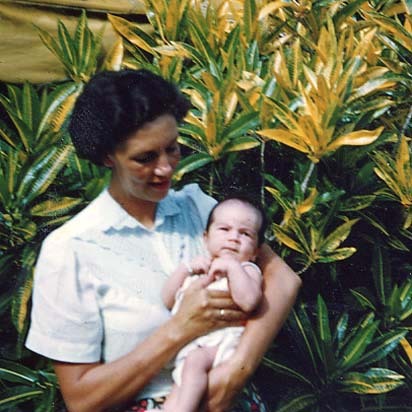 1952 Danny and Mom enjoy the front garden at Aragon Avenue, our first home in Coral Gables. 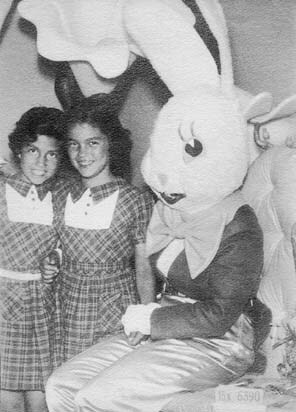 1952 Another view of Aragon Avenue and Cristina and Victoria dressed in their Sunday best. 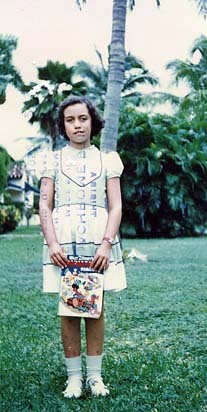 Mom enjoyed sewing and dressing us in similar outfits until we were about 11 or 12 yrs. old. 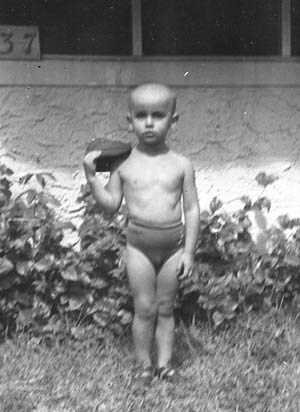 1952 Edgar, in deep thought, forgets to smile, not like him at all. 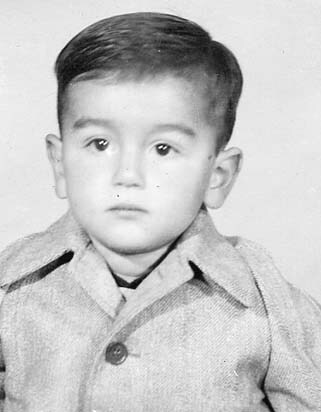 1952 Edgar, about 3-4 yrs. of age; and the last of the children to get the full shave treatment. This tradition, practiced in Colombia, guaranteed thicker, fuller hair. True for the first five kids, though Danny and Constanza who did not receive the treatment also had a healthy amount of hair. 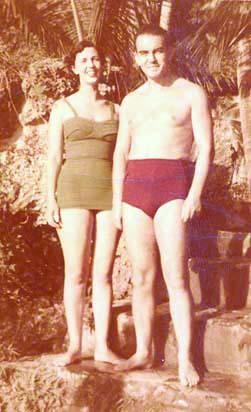 1953 Mom and Dad go for a swim at nearby Venetian Pool. This pool was formed from a coral rock quarry in 1923. We swam underneath caves and also enjoyed a sand beach. It is now registered as a historic landmark in Coral Gables. 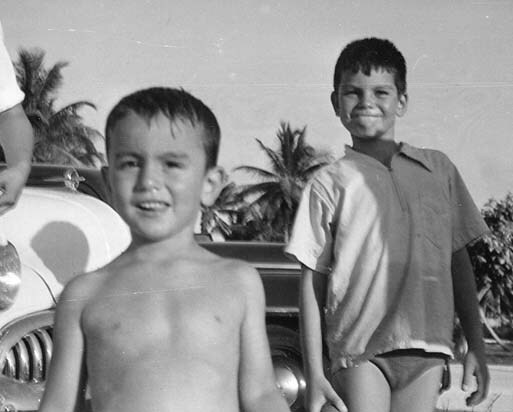 1953 Danny and Edgar ready for a day at the beach. 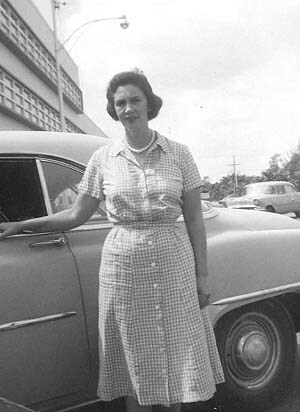 1953 The vegetation of Crandon Park Beach in the background. 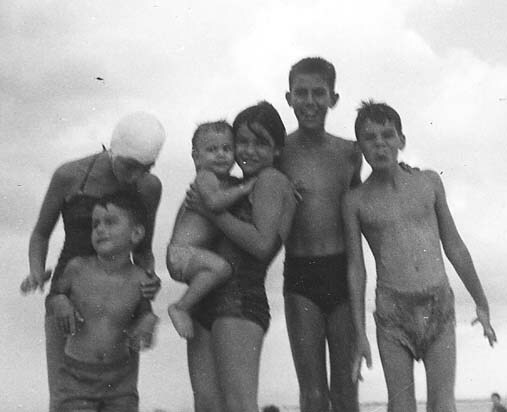 Beach time was anytime, as far as Dad was concerned, and we were frequent visitors. 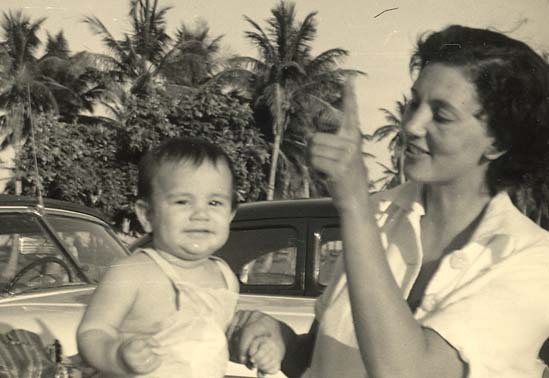 1953 Edgar and Mauricio standing just in front of the family's 50's Chevy at Crandon Park. 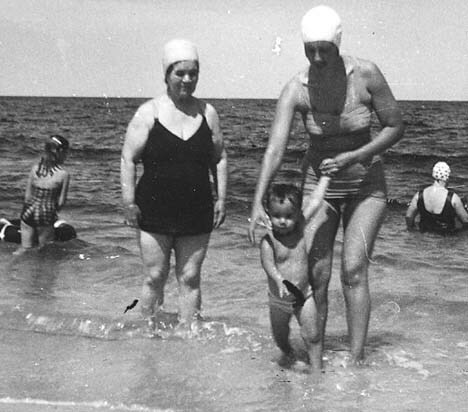 1953 Mama Carmelita loved beach outings as much as we did. Mom can barely keep up with Danny, who is about 12-13 months of age. 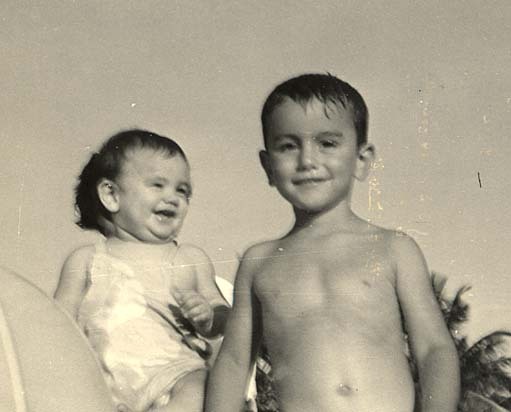 1953 Here is the 6 member crew with Edgar in front of Victoria, Cristina holding Danny, Pacho and Mauricio. 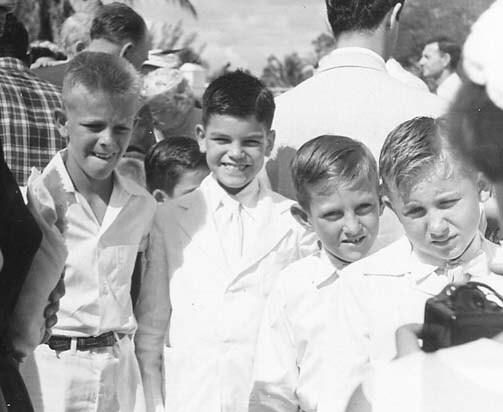 1953 School pictures of Pacho 12, and Mauricio 8, Coral Gables Elementary School. 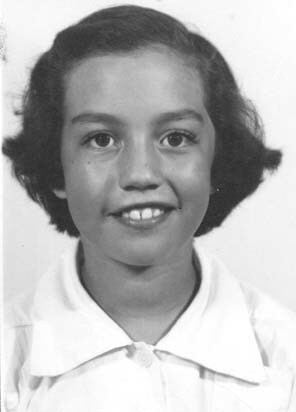 1953 More school pictures.... Victoria 11, and Cristina 10, wearing St. Theresa's uniforms. "STS" appeared in white on the left side of our blue jumpers. 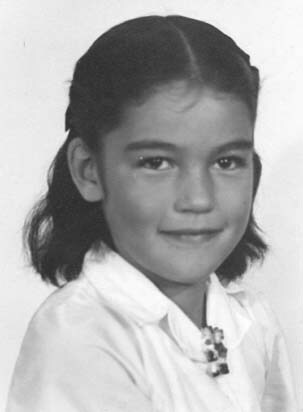 St. Theresa's was our elementary school, and our home on Almeria Avenue was just behind the play area, which was covered with a thick canopy of large banyan trees, fun for climbing and other good stuff. 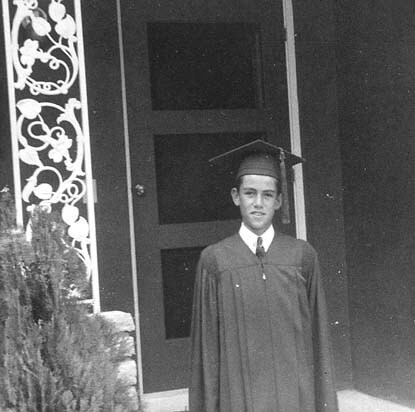 1954 Middle School graduation for Pacho in front of the first (Almeria Avenue) of four houses Dad built, all in Coral Gables within a few blocks of each other. 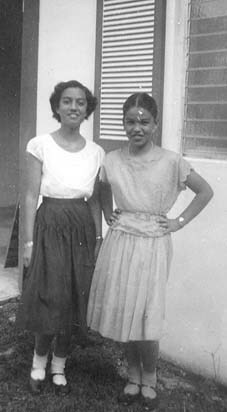 1954 Victoria and Cristina near the back entrance to Almeria Avenue. 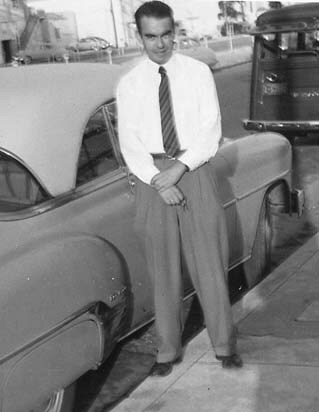 1954 Mom, Dad and their '52 Chevy Sedan. How 2 adults and 6 kids fit in a 2-door auto, is a mystery. 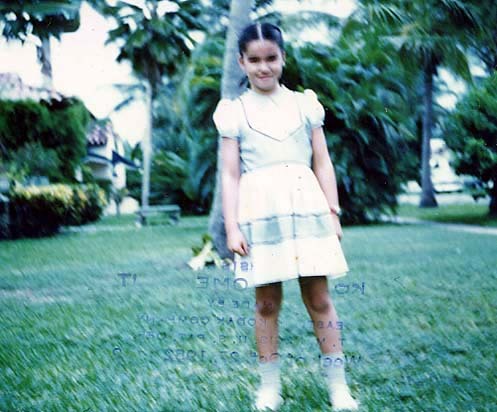 1954 Mauricio makes his First Communion at St. Theresa's Catholic School, directed by the Sisters of St. Joseph and located on Indian Mound Trail in Coral Gables.